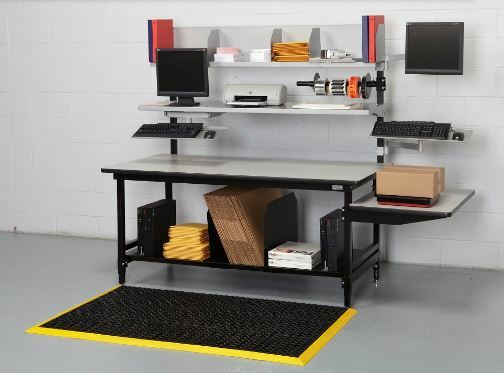 There isn’t enough room at your average industrial workstation. In fact, many order pickers, packers, shippers, and other professionals might tell you that you could have a 10′ long workbench, and they’d still be squeezed for space. In a busy operation, it’s a constant battle between availability of materials and space for doing the actual work. So what’s the solution? A larger workbench top? According to Packmaterials.com (registration required, but a pretty useful resource from Dehnco – we have reprinted the entire piece here, with permission), if there is not enough workstation storage area a bigger table won’t help – and may hurt. So that leaves the question: how do you get more storage space for needed materials if you aren’t supposed to clutter the work surface? These further break down into 8 “reach zones” for ease of supply availability and ergonomics. This is where the most-utilized, must-have supplies, tools, and equipment go. If you’ve delved into product slotting for your facility, this is a microcosm, using the same principles. What is used most often is stored in the most easily accessed areas. The key here is to re-evaluate as things change. Don’t assume what was set up a year ago will be good today, in particular if volumes have changed, if SKU’s have been added, if the people involved have changed, etc. Watch the process; speak with your workers about what is and isn’t utilized frequently. If employees are re-doing the supply storage on their own, look at what they’ve changed and see if it’s practical enough to implement in all your stations. They require bending, reaching, and stretching. They’ll take more time to utilize. Use them for bulk items, infrequently-used materials, slow movers, and other lower-volume needs. These are good for bulky, large items (but not necessarily heavy ones). Pay particular attention to usage rates from these zones, as the type of awkward reaches and movements they cause can cause injuries and bodily stress that you need to avoid. As you re-evaluate the fast-movers, do so with the bulk items. You can also add storage to a typical station. 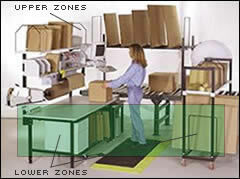 For instance, as pictured above, a conveyor workstation can add significant upper-zone space by using over-conveyor work stations, if room allows for it. You’ll also want to constantly improve the process so that your operation maintains maximum productivity and minimizes ergonomic stress.